FM Derby Girls has seen several changes and reinventions since forming a decade ago. They have changed venues from the Fargo Civic Center downtown, to Skateland (now Skate City), to their current main venue-Southwest Youth Arena in south Fargo. Although they have most of their bouts at the Southwest Youth Arena, they still hold one match per year at the Fargo Civic Center. They have also seen a change in their season. They used to hold their bouts in the Fall and Winter, but that has since changed to more of a Spring and Summer schedule. Fortunately for the organization, the change in season schedule and venue from downtown to southwest Fargo did not come with loss of fans. Interleague liaison Beth Ambrosio says their fans are very loyal and committed to the FM Derby Girls. The organization has also changed some of their focus. While they still have the passion to skate, they also want to become better skaters, develop other physical skills, and build community. For the FM Derby Girls, the focus is not so much on statistics, but on continual improvement. Ambrosio, better known by FM Derby Girls fans as Maulflower, says one of her main focuses is building community and empowering women. “I do believe [roller derby] is a very positive force in people’s lives and can build a very positive community,” she says. She also believes the sport’s early embrace of the LGBTQ community points to their commitment to that same goal. FM Derby Girls is an all volunteer, nonprofit organization, so it takes a certain amount of commitment to keep the organization running. There are 10 active skaters as well as referees and coaches who all work together. Besides their commitment to making sure matches are scheduled, sponsors are contacted, and other duties are getting done, the team holds practice twice a week for two hours at a time. 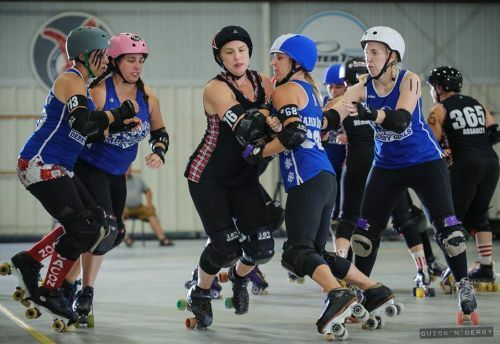 According to Ambrosio, it is a time commitment that can feel like a part-time job at times, but there is a strong belief in roller derby among the organization. During the upcoming off-season, the team will hold training for veterans and new recruits called, “fresh meat.” It is a time to train as a team and find out if the new recruits have the fundamental skills necessary to safely skate in a sport where one wrong move can have serious consequences. Ambrosio says they will also focus on aspects such as rules, track awareness, recognizing specific maneuvers, and strategy. The FM Derby Girls will hold their final bout against the Sioux Falls Roller Dollz this Saturday at the Southwest Youth Arena.